Who is Jesus Christ? There is not a more important question that you will ever consider. The history of the world has been changed by this one question. More importantly, millions of lives over the centuries have been transformed by this one consideration. Entire movements have been formed simply to try to “redefine” Jesus Christ. Major world religions are based upon a variety of definitions—and no other name sparks more offense and emotion in a variety of cultural settings than His name! Who is Jesus? You could never consider a more important question. In this booklet, you will discover what the Bible says about Jesus and what Jesus said about Himself! You will be challenged to set aside the attempts of men to redefine Him. You will be encouraged to embrace the truth that He taught and verified during His life. Consider Christ. Who is Jesus? 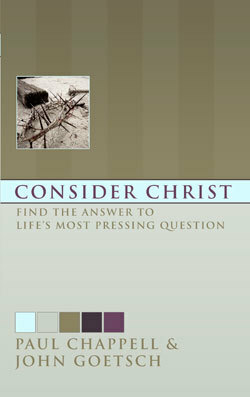 Explore the question, and find the answer from Jesus’ own teachings. Your life will never be the same!